GST partners with Crime Tech Solutions, LLC for marketing and promotional purposes for GST IntelNexus product line. GST IntelNexus™, developed by GeoSpatial Technologies, Inc. (GST), is an advanced intelligence database management system designed specifically for law enforcement agencies to collect, organize, maintain, and analyze sensitive information about individuals, organizations, and their activities. 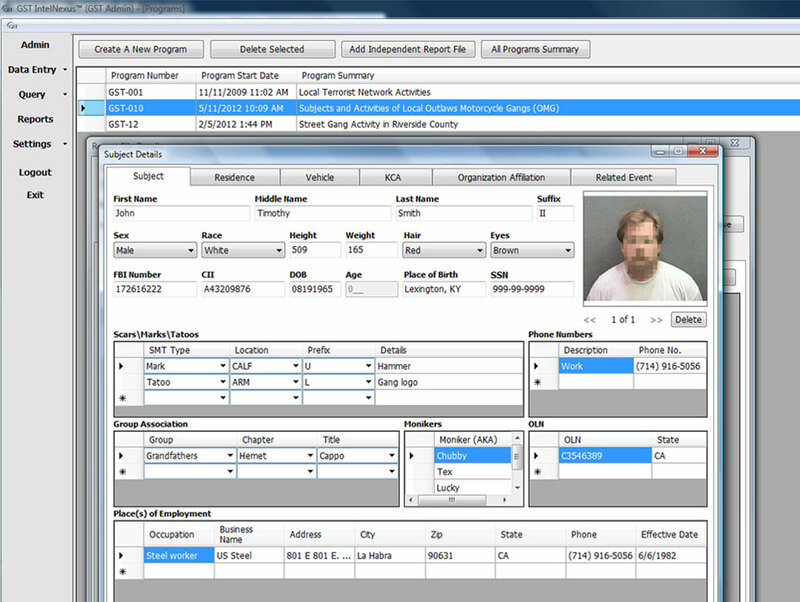 The system enables authorized users to create programs and reports pertaining to subjects, events, and organizations. Authorized users may easily and effectively search and retrieve specific sets of information from the database to create new reports or edit existing ones. A built-in security mechanism requires the approval of system administrators for any new or edited reports to be accepted into the database. The system administrator may audit detailed end-user activities in retrieving information from the database at any time. When a report file nears its required purging date, e-mail notifications are automatically generated to alert the designated personnel. Files of any type can be attached to reports and stored securely in the database for quick retrieval. Location mapping is supported with an add-on module utilizing either Microsoft Bing Maps with national map coverage, or an agency’s own GIS data with detailed local information. 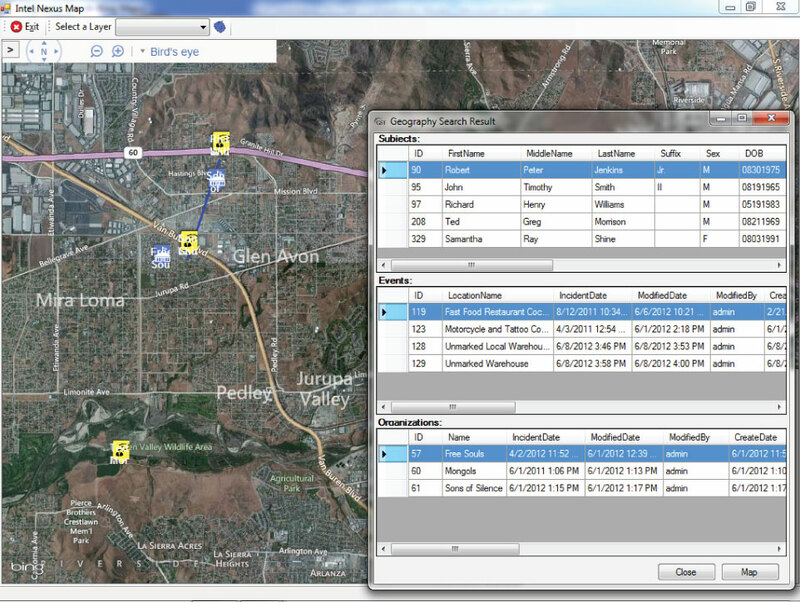 The mapping module enables the user to validate any address and plot its location on the map. 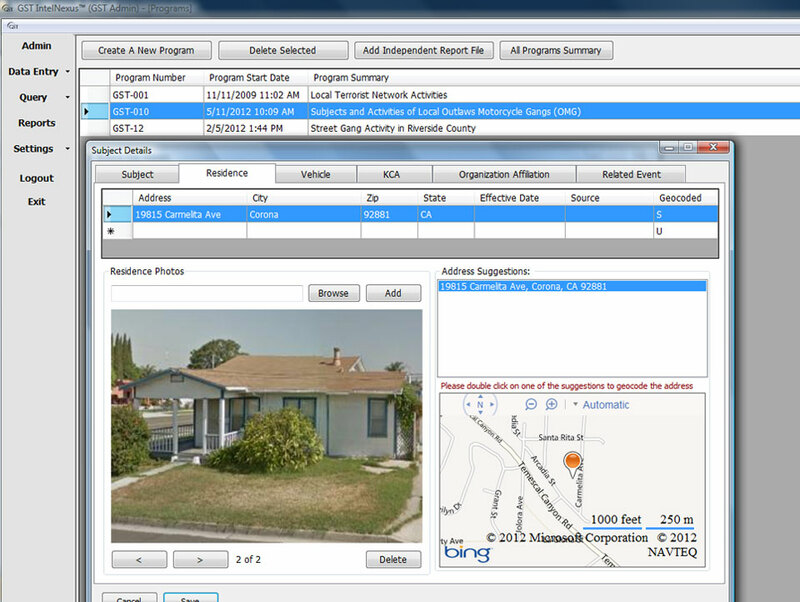 The spatial searching features enable the user to validate any address and find all the subjects, events, and organizations within a specified distance. IntelNexus™ databases can also be linked to GST CrimeMap to utilize its powerful functionality in crime analysis.